The UK government statement follows an investigation into GCM’s activities in the Phulbari region of north-west Bangladesh, where it wants to open a massive open-pit coal mine. The investigation concluded that the company had breached the OECD Guidelines on Multinational Enterprises by failing to “foster confidence and mutual trust” with the people who would be affected by the mine. The investigation failed to consider how the mine would affect the people of Phulbari if it were built, and its conclusions were limited to GCM’s record in the planning phase of the project to date. An internal review of the investigation affirmed that the OECD guidelines do apply to human rights abuses that would occur if the project went ahead. However, the final report failed to address the concrens of the internal review and did not correct the decision to exclude all potential impacts of the project from the investigation. The investigation followed a complaint submitted by the World Development Movement and International Accountability Project. 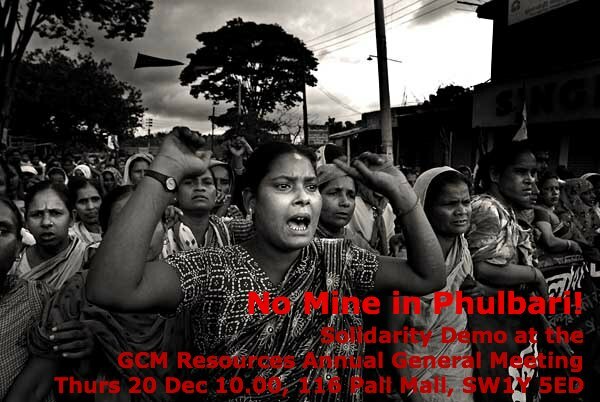 GCM’s planned Phulbari coal mine has provoked repeated protests by local people. Three people were killed and many more injured when paramilitary officers opened fire on a protest against the project in 2006. Protests in 2013 forced the company’s then CEO Gary Lye to abandon a visit to the area. This entry was posted in Global Coal Management, Global Justice Now, International Accountability Project, London Mining Network, National Committee of Bangladesh, National Contact Point UK, Phulbari, Protect Resources of Bangladesh, World Development Movement and tagged Dhaka Tribune, dirty coal, The Daily Star. Bookmark the permalink.